The Good Life Center is the final home of Helen and Scott Nearing, in Harborside, Maine, on five acres of forested land overlooking Spirit Cove. Who Were Helen & Scott Nearing? Perhaps the most resonant aspect of the Nearing’s lives is the fundamental consistency of attempting to live according to their values, approaching a way of life in which they combined the personal and the political, integrating simple living with a goal of social justice, creating lives of integrity. Their influence was widely felt because the homesteading they practiced – building their stone houses, organic gardening, energy self-reliance, using local indigenous resources – embodied aspirations for a principled, sustainable way of living. The Nearing’s lived out their ethical and political logic through pacifism, vegetarianism, and environmentalism. 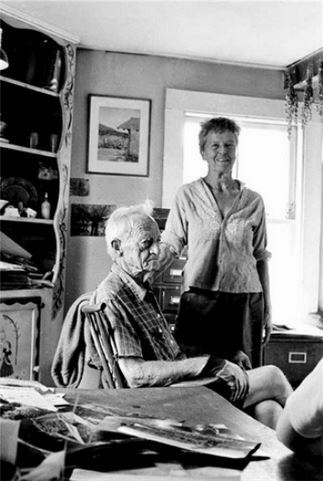 As Scott and Helen wrote in Living the Good Life (1954), “we desire to liberate ourselves from the cruder forms of exploitation; the plunder of the planet, the slavery of man and beast, the slaughter of men in war, and animals for food.” The Nearing’s half-century of homesteading represent not an “exit strategy” from the complexities and contradictions of American culture, but a means of actively provoking genuine social change. The Nearing’s legacy is a demonstration that living a life of integrity can inspire meaningful social change. In the legacy left by the Nearings, simple living is a matter of economic, political, social, and cultural responsibility, a way of life constructed to address what many now understand as the most pressing social crises we face, neither of which can be dealt with through market solutions – insideous economic inequality and an environmental crisis of climate change. As the Nearings understood, our health as a democracy and our sustainability on the earth depend on a common commitment to addressing these issues.